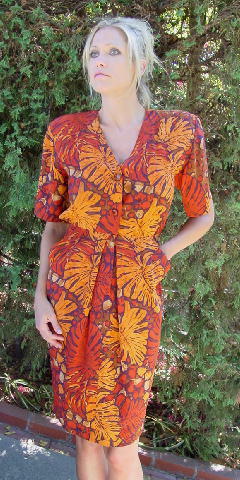 This 100% silk dress is by Gillian. It has shoulder pads, short sleeves, and a 7 1/2" deep V neckline. 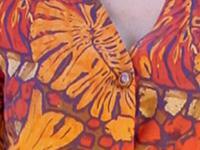 It has a leaf and freeform design pattern in orange-rust, tangerine, brown, sand, and purplish-blue. Below the V neckline is a hidden snap and two multicolored buttons. 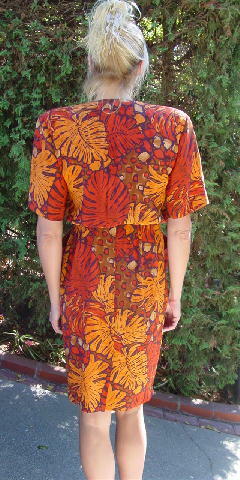 The front waist has two eyehook and thread loops and below that are two hidden snaps. Below the waist are two diagonal side pockets. The waist has a thin elastic strip. There are thread belt loops, but no belt (check out our belt section). The back has a 6" long kickpleat. The front center below the waist has a 24" long vertical panel. shoulder pad to shoulder pad 21"
shoulder to end of sleeve 10 1/2"